Made a poster for girls skate camp in Trondheim. I´m happy to be a part of this project. My friend Sarah Klan has invited 35 designers and illustrators to create a coloring book to raise money for charity. There´s going to be an exhibition The Pekham Pelikan in London, opening July 3. Sticker zine turned out nice! The sticker zines were ready for Pictoplasma 2017 where we had them for sale. This pic is from Goldmaki´s instagram. Jeg deltar med en tegning på denne utstillingen. En tegning i tusj, svart på hvitt. Den heter "City Ghosts" og handler om det gamle i møte med det nye. Denne gangen var jeg såpass urutinert at jeg ikke fikk tatt bilde av mitt eget verk før jeg leverte det fra meg. Jeg har kun noen bilder fra tegningen mens den fortsatt var under arbeid. The Egg Shooter. I made many color examples . Gilbert, the main character, in his running pose. Mostly in the game he´s also puking. About the game, from the developers website http://eggg.gg : "The game is developed by Hyper Games – a studio of 5 people based in Oslo, Norway. The game is based on a movie called Gilbert’s Grusomme Hevn (Gilbert’s Cruel Revenge) made by the Norwegian movie producer Maipo Film, and is in turn based on a kids book called Eggg by Stein Erik Lunde. We also work together with the amazing Spanish illustrators Brosmind and the Academy Award winning animators Mikrofilm." Dermed er Ting vi trenger blitt kjøpt inn av Kulturrådet!! Da kommer boka vår i bibliotekene rundt om i landet. Veldig fornøyd med det! "Ting vi trenger" ble endelig lansert etter fem års arbeid med boka! Lørdag kl 14 satte Silje Rønneberg Hogstad og jeg oss ned i gjestesofaen på festivalscena, og med Lene Ask som intervjuer og fullsatt sal, ble det god stemning. Finally, after five years of working on the book, he had the it released on OCX! 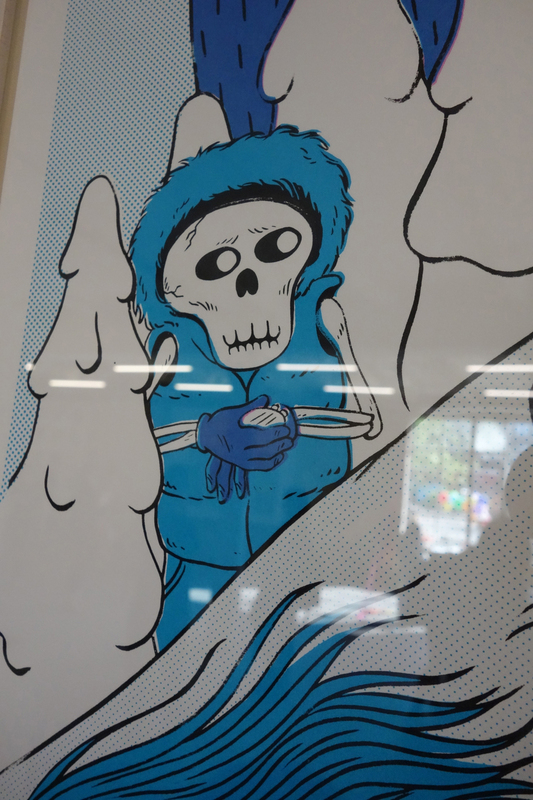 "CharacterMart is a vibrant display of characters by 11 artists from various countries. The exhibition will be held at the Biscuit Factory in Leith, and will show prints, sculptures and art toys." Living and working for two weeks in Casa Randi, a house with a nice studio located in Icod de los Vinos, on the north side of Tenerife , brought us a big step forward in the work of our comic book "Ting vi trenger". Silje Rønneberg Hogstad who is writing and coloring the book, and me. Drawing all day, all night. We took sunday off and climbed to the top of Mount Teide, 3717 moh (12 198 ft) ( in jeans and sneakers! ). Here we are standing on the very top, inside the volcano of Mount Teide. I forbindelse med Kulturuker i Gjerdrum laget jeg en 75x40 meter stor tegning - med traktor. Med god hjelp av jordeier, målte vi opp og ploget det store bildet. Han på traktorsetet, jeg i en slags regissørrolle. Med god hjelp av Oddmund Hønsen. Me in my biggest drawing so far. 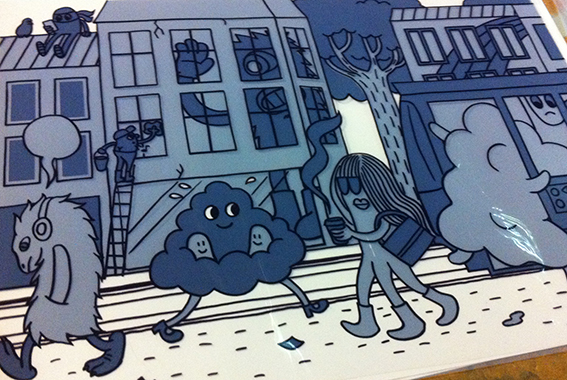 April 29- May 3 , Memory Cafe, Berlin, groupshow with The Eggplant Collective, on Pictoplasma! It´s jedi training, a real test of patience, but a good drawing exercise. For this month´s theme of TEC (The Eggplant Collective) "LOVE", I chose a drawing I did last year. The drawing started out as a drawing of me and one of my kids, but rather than a drawing of people, I wanted it to be more the feeling of a hug. Jeg ble spurt om å bidra med ett bilde på EmptyMixUpFrame 2 på Nordic Black Theatre/ Caféteatret på Grønland i Oslo, noe jeg absolutt ville være med på. Tema var portrett, og etter en tid med skisser og tanker, kom jeg fram til "Fylgja Mind". Fylgja er en hjorte-aktig figur jeg har jobbet med et års tid, siden Pictoplasma Academy. Jeg vurderte silketrykk, men endte opp med spraymaling og sjablonger, noe jeg har hatt lyst til å jobbe med en stund. I was asked if I wanted to contribute on the exhibition EmptyMixUpFrame 2, where the theme was "portrait". After a couple of months work I ended up with "Fylgja Mind". Fylgja is a deer-like character I´ve been working on since last years "master class" on character design Pictoplasma Academy. I was thinking of making it as an silk screen print, but decided I wanted to use spray paint and stencils, which I have been wanting to try for a while. Work in progress, in the garage at home. Etter iherdig arbeid med tegning og planlegging siste seks månedene, ble det endelig tid for Pictoplasmas 10. festival og første "academy" utstilling: All-stars Group Show på galleriet Urban Spree. After six months of drawing and planning a print, it is time for Pictoplasmas 10th festival with their first Pictoplasma Academy Exhibition: All-stars Group Show at Urban Spree, Berlin. "Downhill/Uphill". My contribution to the exhibition. Pictoplasma Academys first Group Show at Urban Spree. 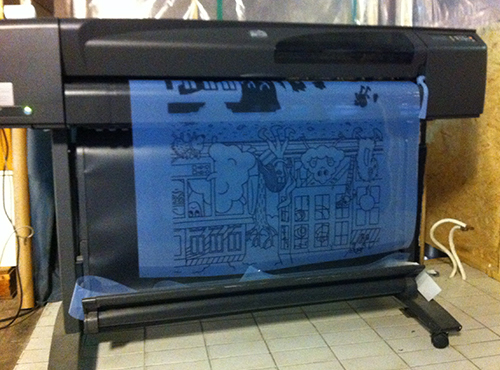 Screen ready for printing, this is for color gray. Trykk til tørk mellom hver farge / prints left to dry between each new color. On Pictoplasma festival 2014 that takes place in Berlin April 30 - May 4, we who participated in Pictoplasma Academy will have an exhibition together. Our show/ exhibition will be in one of the galleries of Pictoplasmas famous Character Walk. "...a venturesome CHARACTER WALK invites to over 20 galleries and showrooms throughout the districts of Berlin Mitte and Neukölln. Join the stampede from April 30 - May 4, and expose yourself to work by many of the participating conference speakers and international artists, featuring originals, installations, sculptures, limited editions, and the very best of contemporary character design and art. Another highlight of the Character Walk will be the premiere of the Pictoplasma Academy group show, introducing fresh, upcoming and surprising work by the forty international talents that have participated in Pictoplasma’s first annual master-class. " Dag tre av Pictoplasma Academy er over og for et opplegg! Vi er 40 deltagere med Rilla Alexander og Nathan Jurevicius som mentorer for hele kurset. Og i morgen er det Gary Baseman som holder workshop! I can´t wait! Day three of Pictoplasma Academy is over, and what an amazing academy!! We are 40 participants with Rilla Alexander and Nathan Jurevicius as our tutors through the whole eight days of "school". Tomorrow we have "Personal private session" with Gary Baseman. I can´t wait!